I first started planning my trip to cover several confluence points in the south of Belarus in the middle of 2006. However, I managed to actually go there in January 2007. My plan was to find all the remaining confluences in the south of Belarus, starting from the one most eastward, i.e. 52°N 30°E. I left Warsaw by train on 10th January in the evening, crossed the border in Terespol on the Bug river. In Brest I changed trains to the one to Homel. I reached Homel on 11th January at 6:30 am. From there, at 8:30 am I set out by a mini-bus through Retshytsa to Khoiniky. I got off the bus in a place, where the road cut the 52nd parallel. At 10:00 am I started my march to the West. The forest I walked through was really diverse. On my way I passed marshy alders, dry birch woods, peat bogs, swamps. I had to go round some of those. At 11:00 am I reached a non-electrified railway between Vasilyevitshy and Khoiniky. I reached this place at 11:10 am. 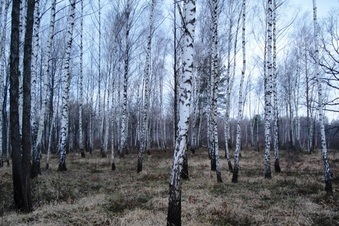 This point is located in beautiful birch woods, where, here and there, you can find oaks and marshy hollows. When I was going back it started raining and it was extremely windy. After I got to the railway again, I walked along it to the north to the village of Osovo. There, at 1:40 pm I got on a train to Khoiniky (there are two a day). I got to Khoiniky at 2:00 pm. From there I wanted to go on foot to Mozyr, taking the P35 road. 5 km outside of Khoiniky I hitchhiked all the way to Mozyr. I was there at 4:30 pm. I spent the night in the “Pripiat” hotel. A double room cost $10! In the morning I set off to 52°N 29°E. Attention: In December 1989 the area around the Confluence had a radioactive surface contamination from Caesium-137 of 37-185 kBq/m², the half-life of Cs-137 being 30 years. Even higher contamination values (above 1480 kBq/m²) can be found to the South and East of the Confluence. Thus approach should be done coming from the West or North, the time of stay in this area should be kept as short as possible and appropriate measures should be taken by the visitors to protect themselves against any radioactive contamination.